Suegene Wagner, first row, second from left. Some people enjoy solitary runs, while others like to run with the pack. Count Suegene Wagner, assistant controller in accounting research at Akron Children’s Hospital, among those in the latter group. 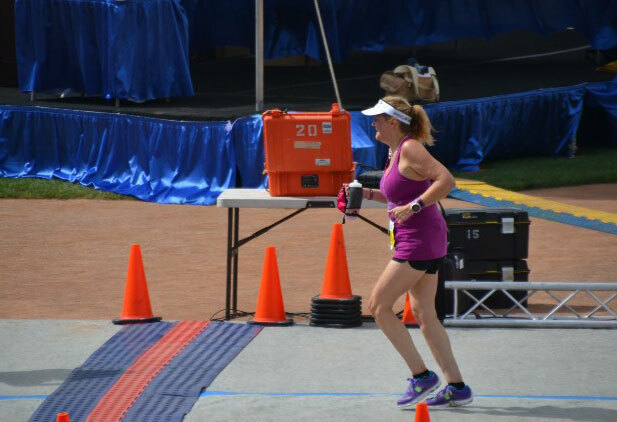 Since becoming involved with a running club 5 years ago, she has run 16 half marathons and one full marathon. Plus, she’s developed new friendships and healthier routines. Suegene used a tried-and-true training method developed by running enthusiast Jeff Galloway to get started. The following year, she participated in the Akron Half Marathon, walking the entire 13.1-mile route. The Half Marathon course takes an estimated 3.5 hours to complete. Runners – as well as walkers – need to have a continuous pace of 16 minutes per mile to complete the route in that allotted time. She decided to join Northeast Ohio FIT, a running club designed for anyone who wants to train for and complete a marathon or half marathon. 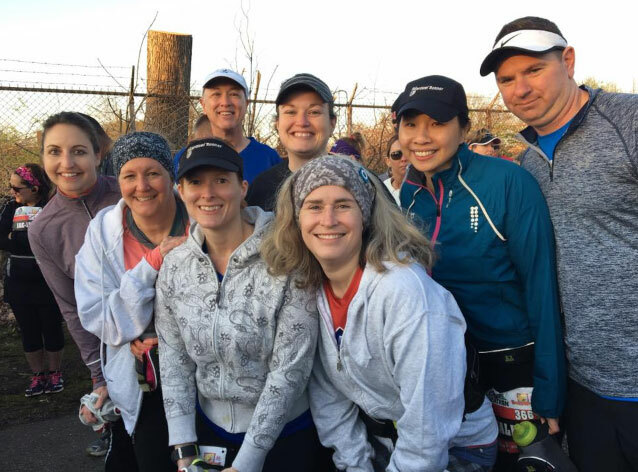 Although the organization charges a membership fee, the group helped Suegene overcome mental and physical barriers to running. The seminars, nutrition guidance, idea swaps and resources Suegene found there have been invaluable, too. 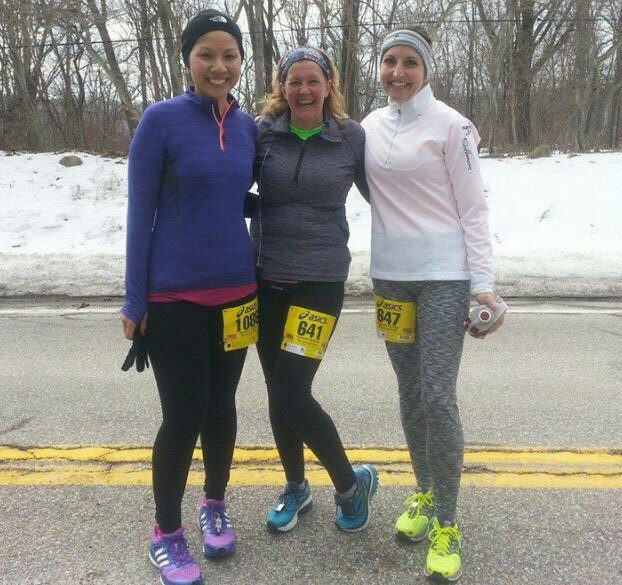 For instance, last year she decided she wanted to run the full 26.2-mile marathon, instead of just the half. “They taught me that there are right ways and wrong ways to train,” she said. “I’ve learned that because I’m over 50, I need to train differently for longer-distance running than someone who is 30. My body needs more recovery time.” She also cross-trains, taking yoga classes to stay strong and limber. Suegene and a group of NEO Fit friends drew inspiration from each other to run the 2015 Akron Marathon. They used the Galloway method of running for 3 minutes and walking for 1 minute to complete the race. 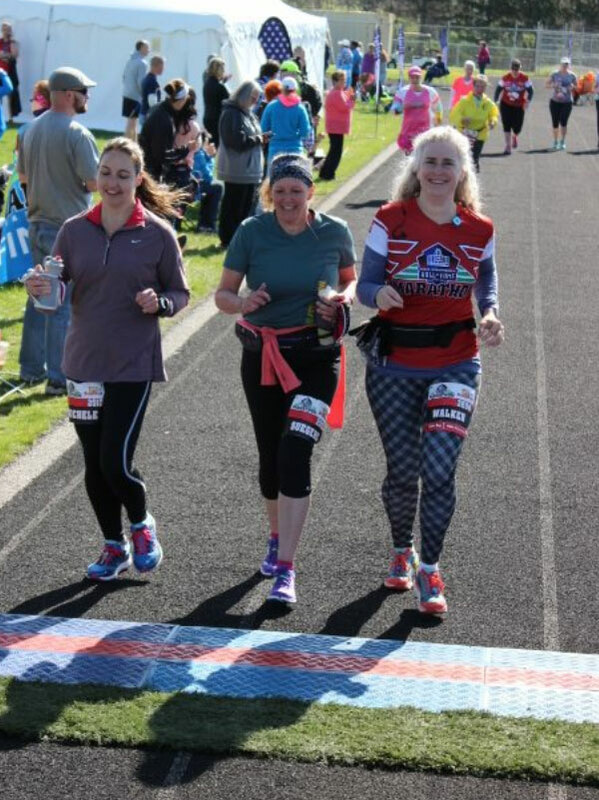 That experience and the support she’s received through running prompted her to set another goal: Participating in the New York City Marathon in November. The insecurity she felt about running is now long gone. This story is part of a series called Mile in My Shoes that features Akron Children’s Hospital employees who are participating in the Akron Marathon Race Series.